I have always felt that differences between subsidized and unsubsidized smartphone markets are poorly understood. Apart from the obvious differences in pricing patterns, OEMs face different bases of competition in each type of market because of the differences in customer ownership (i.e., the OEM vs. the carrier). In unsubsidized markets, the distribution model forces pricing patterns to be natural. Therefore, based on rapidly improving smartphone quality, we can theorize that OEMs rely on different bases of competition at different market tiers. The wide availability of the Android platform has ensured that application availability is no longer a primary competitive advantage to OEMs. In the low-end market (sub-$200), where device performance is still lacking, OEMs have been attempting to differentiate based on improved performance (examples include numerous low cost vendors in India and even Nokia's Lumia 520, even though the latter suffers from lack of application availability). In the high-end market (~$300+), device performance is no longer much of a differentiator and OEMs have been banking on brand value (rapidly eroding as a result of low-cost vendors moving upmarket) and catering to specific segments based on screen size, materials, etc. (examples include Samsung & Sony). In subsidized markets, this dynamic is very different. Since carriers control the customer relationship and pricing, they become the OEM's direct customer. Therefore, the basis of competition changes from product attributes to a carrier's requirements from the product. Carriers primarily push smartphone sales for two reasons - 1) To increase data consumption and revenues, and 2) To increase their subscriber base and reduce churn rate. The question then boils down to this - When does a smartphone become "good enough" for a carrier in subsidized markets? Of course, it is important for major carriers to have access to major smartphone brands to minimize churn, but this shouldn't be a major long-term problem. So the obvious answer to this question is when smartphone quality reaches a point where the choice of smartphone does not have an effect on a subscriber's data consumption habits. At this point, what would be a rational decision for a carrier to make with respect to smartphone distribution? Should carriers continue to subsidize smartphones and commit massive marketing budgets to major OEMs, should they move to unsubsidized, monthly payment plans like those at T-Mobile or should they attempt to sell white-label smartphones under their own brand? These are questions that carriers will have to grapple with as smartphones continue to improve. When Will Smartphones Be "Good Enough" For Carriers? Android users consumed much more data than iPhone users on T-Mobile (this data pre-dates the iPhone launch on T-Mobile). On Sprint, data consumption for both platforms is now equal thanks to the decline in iPhone data consumption and growth in Android data consumption. Verizon and AT&T show very similar patterns, where iPhone users consume more data than Android users, but the iPhone's lead is shrinking. It is no coincidence that per subscriber iPhone data consumption is higher for those carriers where the iPhone owns a larger proportion of smartphone sales. The decline in iPhone data consumption is also consistent with increasing sales of older iPhones, suggesting that buyers of cheaper, subsidized iPhones consume less data. These patterns basically show that data consumption patterns are driven largely by consumer demographics and not by the platform itself. 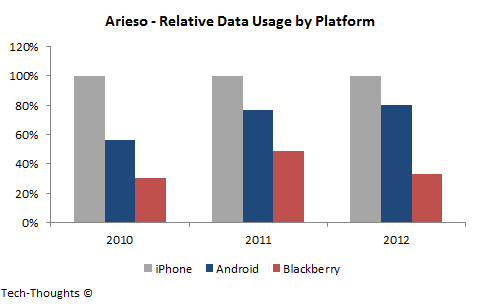 Another study, by Arieso, studied data consumption habits for flagship smartphones used by subscribers of a Tier-1 carrier in Europe (although Arieso says that these patterns are similar across regions). The chart below shows the average data consumption (both uploads and downloads) by platform, for flagship models released in each year. The chart above shows that the data consumption gap between the "latest" iPhone & flagship Android smartphones has rapidly closed over time. 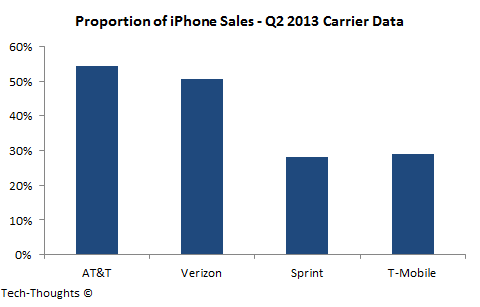 Even the iPhone 5's LTE driven data consumption spike was not enough to maintain the scale of the iPhone's leadership. This trend should continue in 2013 as well and is consistent with my previous assertion that demographics are a bigger driver of data consumption than the platform itself. 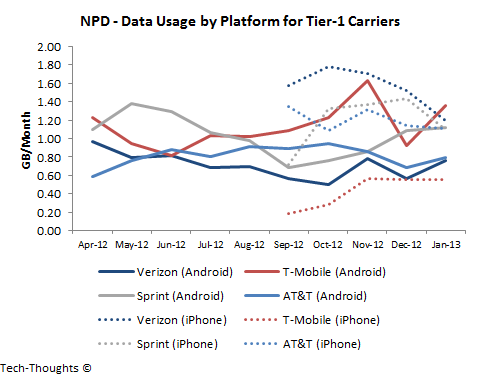 This suggests that smartphones are rapidly becoming "good enough" for carriers from a data consumption perspective. With data consumption rates becoming "good enough" and increasing competition from the prepaid segment and T-Mobile, it may not take much more for carriers to begin re-evaluating their distribution strategy for smartphones.